Cloud-based content collaboration service Huddle has taken one step toward becoming a one-size-fits-all service by adding word processing functionality to its web and iOS mobile apps. 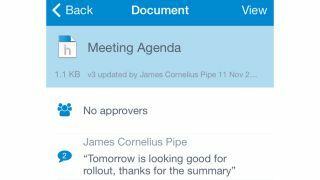 Dubbed Huddle Note, the new feature lets its users create or edit documents that can be shared, moderated and commented on. Integration with Huddle's platform means there's also version control, audit trail and activity history baked in, and notes can be approved. It means that you'll get similar functionality to Google Keep, Evernote for Business or Quip without leaving Huddle - and notes are covered by the service's ISO27001 security certification. In a statement, Huddle CEO Alastair Mitchell said that its introduction will simplify the document editing process as users won't have to skip between apps and use separate platforms to upload documents. In addition, Huddle has redesigned its iOS 7 app while adding a bunch of new features. They include notifications related to shared documents, an activity stream that shows work being done by colleagues, contractors, partners and clients, and an "Open in" shortcut for opening third-party applications quicker. Mitchell told TRPro earlier this year that Huddle adopted an invitation-only system for externally sharing files to reduce risk, so the introduction of Huddle Note makes sense in that it keeps employees away from potentially insecure third-party cloud apps. A recent study by antivirus vendor McAfee found that more than 80% of 600 IT and business decision makers admitted to using non IT-approved software-as-a-service (SaaS) cloud apps in the workplace, potentially leading to risks associated with security, compliance and availability. How is Huddle transforming business collaboration?